There’s been a place high on my Perth restaurant wish list for a while now. Touted as the best BYO Restaurant in Australia it’s a wonder it’s taken me so long to get there. I was all the more sold on the idea of a visit after sampling some of Head Chef Stephen Clarke’s wares at the Breast Care WA’s Long Table Lunch earlier in the year (http://perthmunchkin.com/2011/04/17/breast-cancer-care-wa-long-table-lunch-2011/). It was amazing. It was also on that outing that I’d realised that I’d gone to school with the now Sous Chef from Clarke’s. Ahh Perth, it’s a small world after all. So I made a booking and was set to head along with GG and the M&M’s. A quaint dinner for 4, sure to be delightful, especially given both couples had really embraced the BYO nature of the place and bought along a bottle of white (one Chardonnay, one Riesling) and a red (A Shiraz and a Pinot Noir) – so it had the makings of an enjoyable evening right there. From the outside Clarke’s is very unassuming. Clarke’s is located on a quiet street, one back from the beach with residential properties across the road – a hidden treasure perhaps. Not at all how I imagined and that sentiment was continued when I walked inside. I’m not sure how I had imagined it in my head but it was different to that. Not a bad different though, perhaps just slightly more casual that I had anticipated. The walls were adorned with the numerous awards that they had won, including a very impressive gold chef’s hat trophy, which is was for Chef of the Year from 2007 through to 2009. I found the service at Clarke’s was right on. Water glasses were never empty for long (your choice of sparkling, still or filtered tap available) and your wine was also being regularly replenished. When you first arrived your BYO white wines are taken away and chilled, the red wines taken and opened to breathe. Corkage at only $4 a person seems very reasonable for the establishment. Our group had deciding prior to arrival that we would give the degustation menu a go (which is my favourite way to dine – an excuse to try so many flavours!) and also went for the additional cheese option. Because cheese is a wonderful thing, especially good cheese. 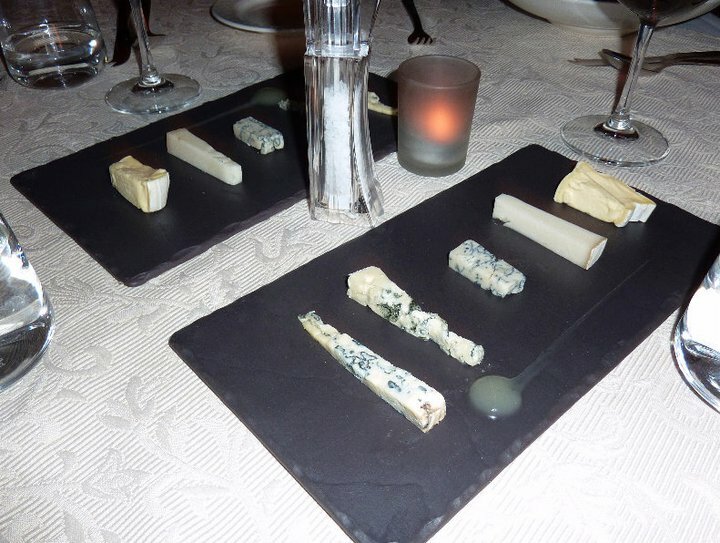 This was priced at $115 a person, including the cheese. 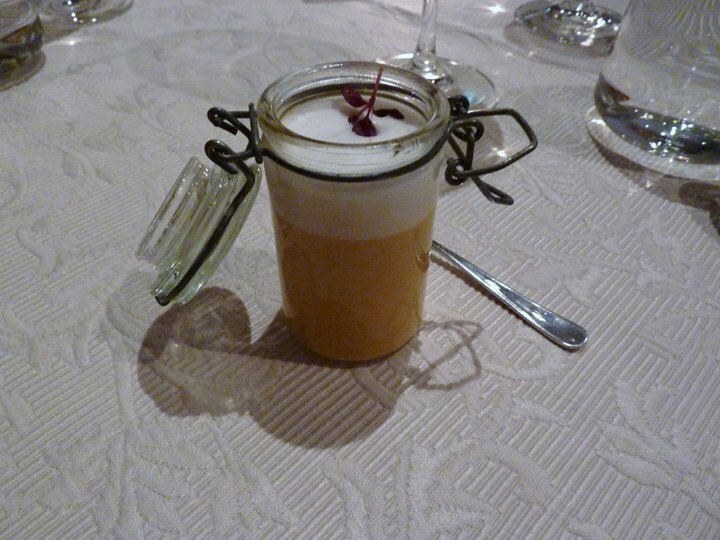 The first course didn’t take too long to arrive and was an amuse bouche, creatively presented in this super cute little jar. We weren’t told what this course was so it was fun to guess. It kind of looked like a jar of lemon butter with cream on top. As it turns out it was soup…. Of the tomato persuasion. 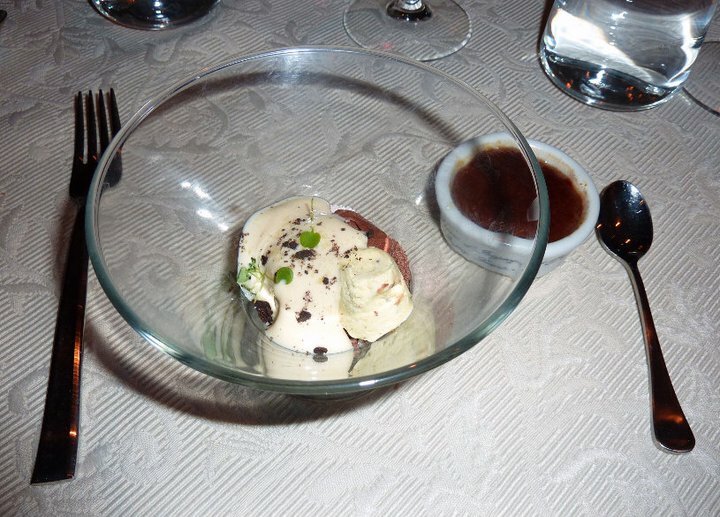 It was creamy and delicious and had us all the more excited about the other courses that were still to come. The timing of the courses was also worth noting. It’s important (to me at least) with the experience of a degustation that the pace is fairly leisurely, in fitting with the indulgent wonderfulness of spending several hours with good friends and enjoying great food. Clarke’s recognises this and nothing throughout the evening felt rushed. 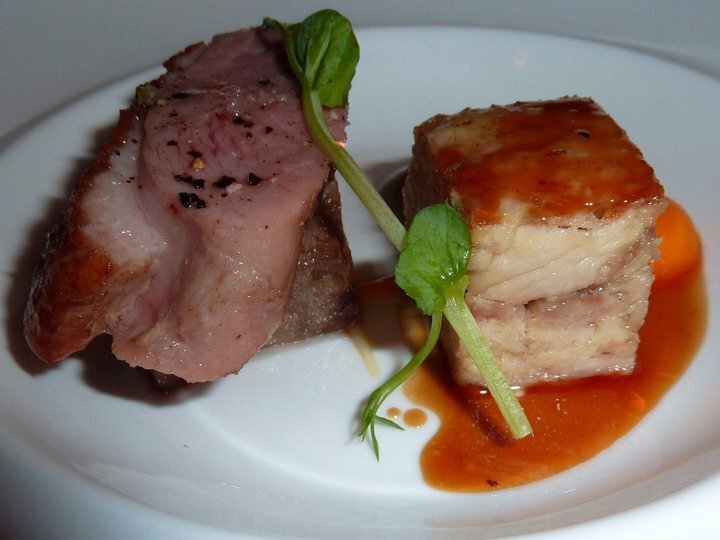 Pork and apple has long been a winning combination of flavours and the Clarke’s interpretation of this classic combo was both creative and delicious. 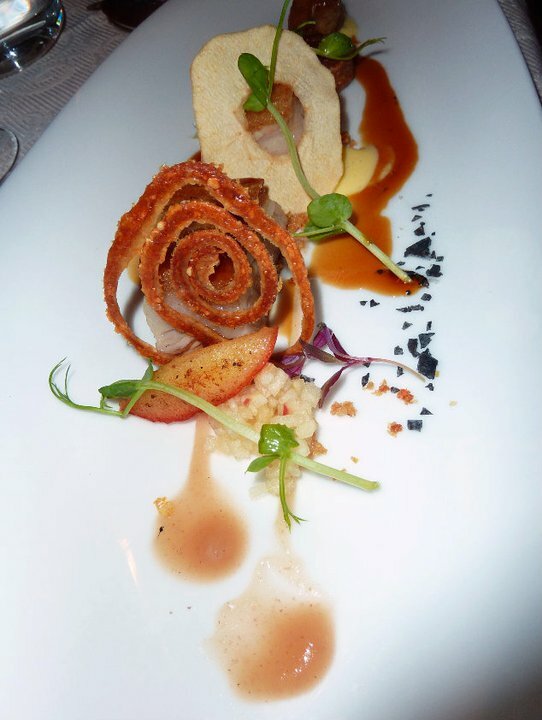 Linley Valley pork belly, crackle dust and apple textures. Melt in your mouth morsels of pork belly, a chewy spiral of crackling, more cracking in dust form (best kind of dust ever!) and with different types of apple – freshly diced, in sauce, dried – it worked a treat and the sweetness there was a pleasing contrast to the salty pork. 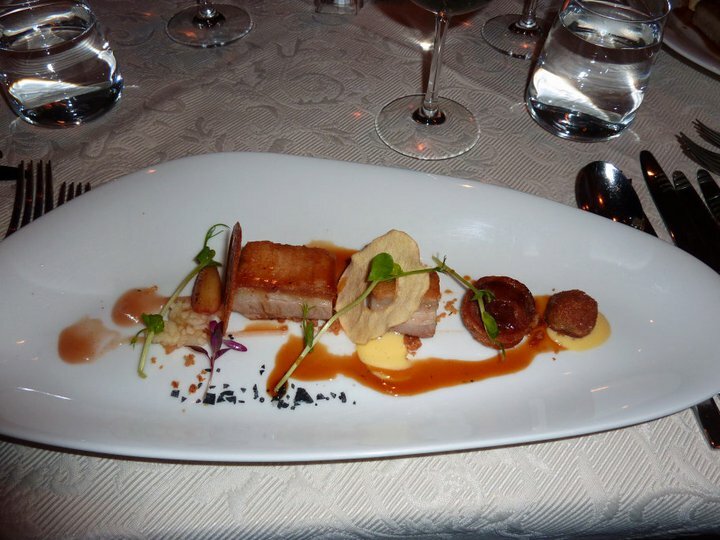 Pork and apple, sweet and sour – brilliant! Following this was a seafood course. 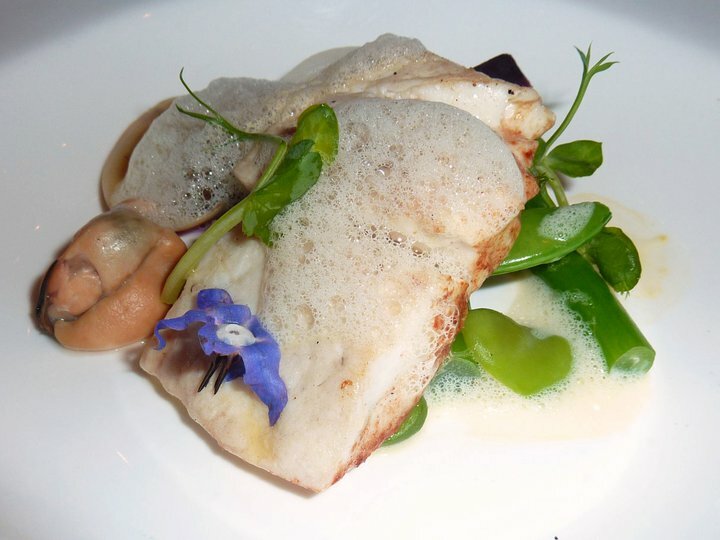 Roasted line caught Pink snapper with mussels, clams and saffron emulsion. I’m not a huge seafood eater and it was my first time eating clams or a mussel from memory… They didn’t have a strong flavour, which was I was grateful for. And I didn’t mind the fish. Perfectly cooked and without a fishy taste, it was pretty good JI’m sure if you were a seafood fan you would have been suitably more impressed with this course than I was. It did present beautifully though with its foam (very beachy) and flowers throughout. Given I have a habit of memorising degustation menus before I arrive at a place, in anticipation of the event, I was then surprised by the arrival of an additional course. And it was duck! What a fantastic wonderful surprise course it was. I am very spoiled. 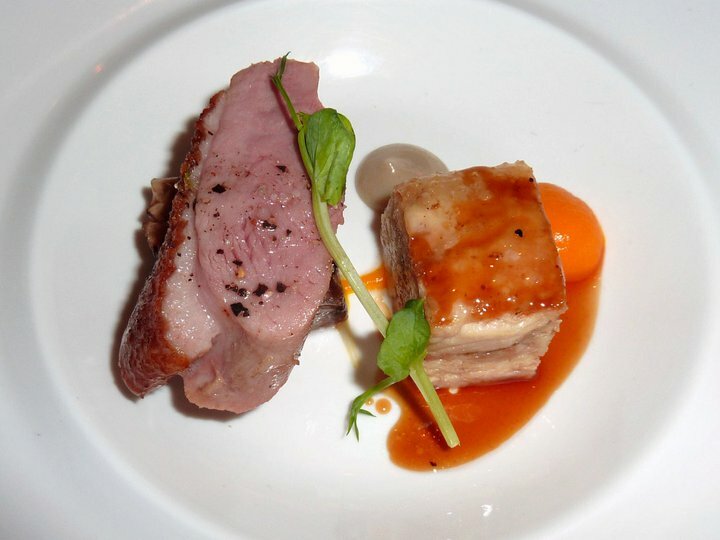 The perfectly pink duck breast came with a square of compressed chicken and some hollandaise sauce and thyme jus. It was delicious. I think I’ve eaten more duck this year than I have my whole life. I find it so hard to go past on the menu. And it rarely disappoints and it definitely didn’t on this occasion. So as we’d switched to the reds by this point and they worked well with the next course. 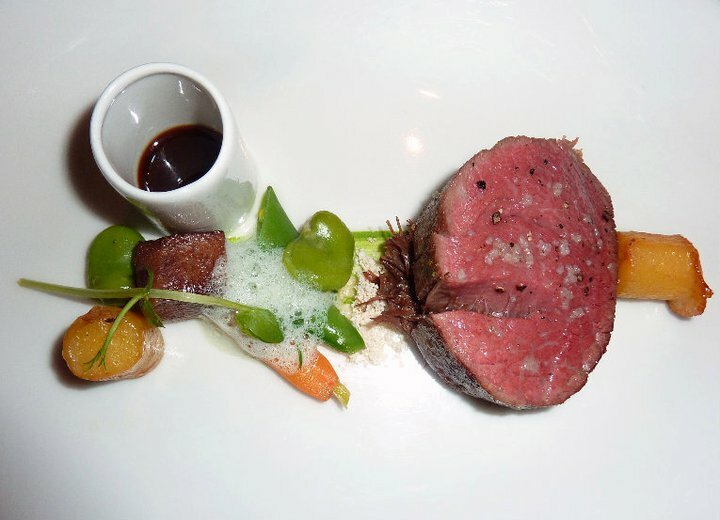 Aged prine fillet steak with Parsley and wild garlic puree, fondant potato and thyme jus. With its tiny jar of gravy on the side and the intricately prepared little vegetables it was fantastic. 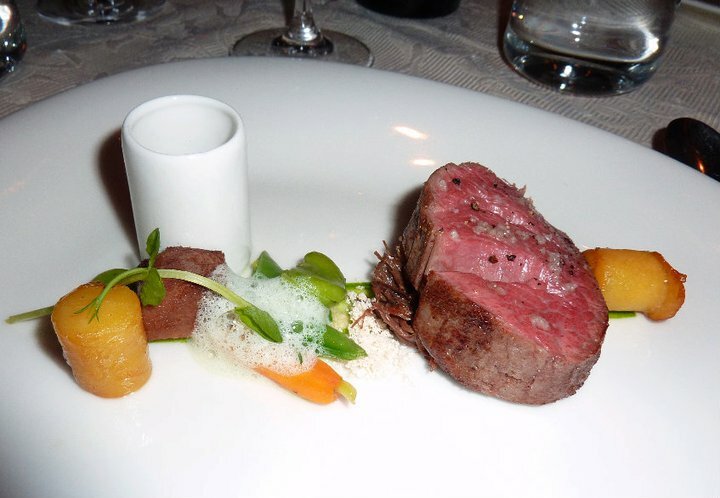 The meat was perfectly cooked and complimented further by the jus. And there is something wonderfully dainty about eating little vegetables. So before we launched into the sweeter side of life it was time for fromage. We had all said we would partake in some cheese however a suggestion came from the kitchen that perhaps we’d only need two cheese plates to share. Wise words and we are glad we heeded the warning. 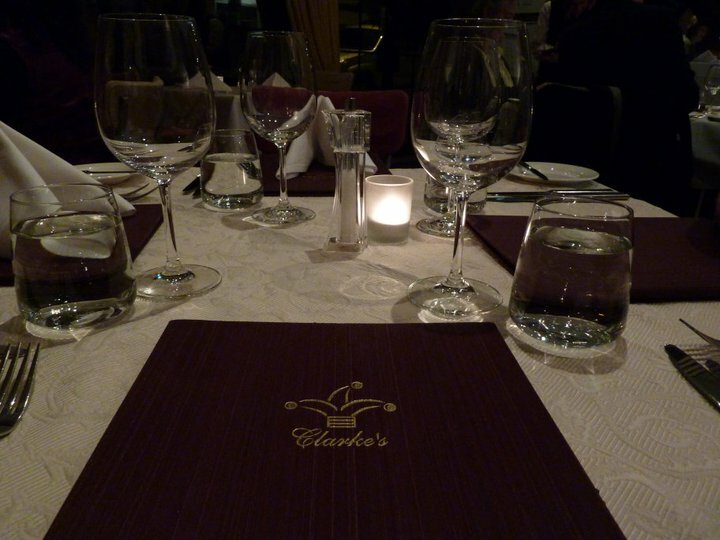 They offer two cheese platters at at Clarke’s – either a blue cheese or a soft cheese option. So they made us up two plates or slates I should say that had some of each for us all to try. It was the perfect amount. And the blue cheese was divine. I’m not sure which one I fell in love with more, the Saint Agur or the Roquefort. It came with a swirl of apple sauce which made for a heavenly mouthful with some of the salty blue. The rye bread that came served with the crackers also warrants a mention for the wonderful caraway flavour it had. Ahh good bread and cheese, one of life’s simple pleasures. It was then time for pre-dessert. Chocolate Creme Brulee. 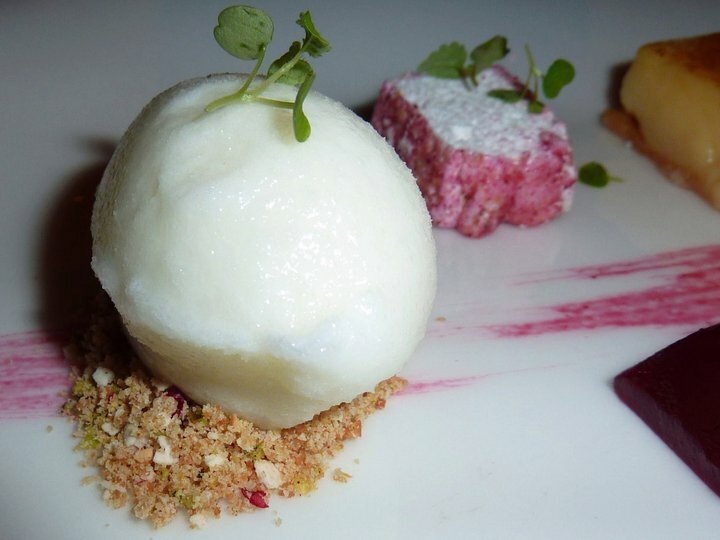 In discussion with my best friend, sitting to my left, that all future meals should include a pre-dessert, as a prelude to the wonder of dessert. 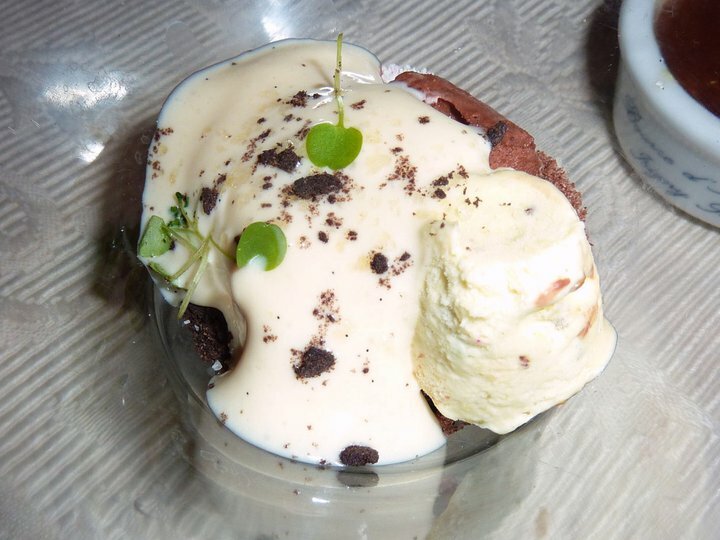 It was described to us as the Chef’s selection of soil, so naturally we were intrigued. It was dehydrated raspberries and chocolate and a dash of popping candy. What a wonderful inclusion – memories of childhood and the first time you’ve tried the magical stuff. And as well as this there was Baileys, pistachio and a side of chocolate creme brulee. It was a taste sensation. And this was the pre-dessert! Life sometimes is just so good you can’t help but take pause and smile. I loved this course. It was both precious and delicious. So with our palettes prepped, dessert arrived. And for the final course the presentation was impeccable! 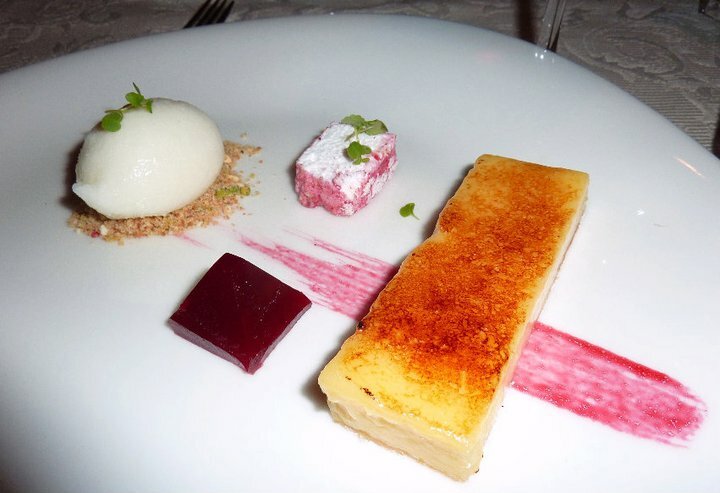 Carmelised lemon tart, raspberry jelly, lemon sorbet and vanilla marshmallow. I have a lot of time for all things lemon which often surprises my GG who perhaps doesn’t always sway on the side of citrus. 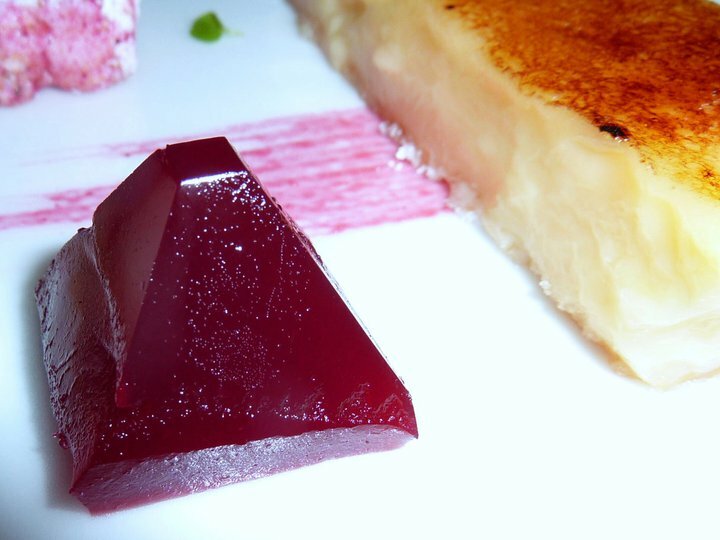 I loved the lemon tart – the perfect blend of sweetness with a subtle hint of soury zap. And I did perhaps consume the raspberry jelly pyramid in one bite. One fabulous bit I should add. And it was a similar story for the marshmallow, which just melted in your mouth. 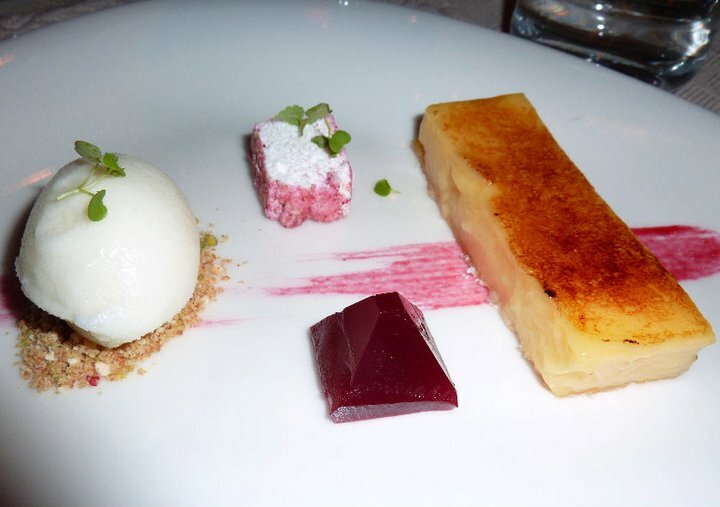 And I took my time finishing off the plate, with a little of the tart and a little of the sorbet which was so refreshing. What a high note to end on! The boys then each enjoyed a cup of tea while M and I savoured our last sip of red wine. The food has been sensational. I had high hopes going in and every expectation had been well surpassed. Polished service, creative and delicious food and being able to bring your favourite wines to enjoy with some of your favourite people. Doesn’t get much better than that!